Journal of Gender and Power is aimed at providing an international forum for discussing various issues and processes of gender construction. It is a scholarly, interdisciplinary journal, which features articles in all fields of gender studies, drawing on various paradigms and approaches. We invite scholars to submit articles and reviews reporting on theoretical considerations and empirical research. 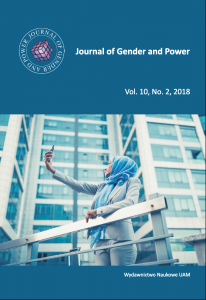 Journal of Gender and Power is published by Faculty of Educational Studies, Adam Mickiewicz University (Poznan – Poland).